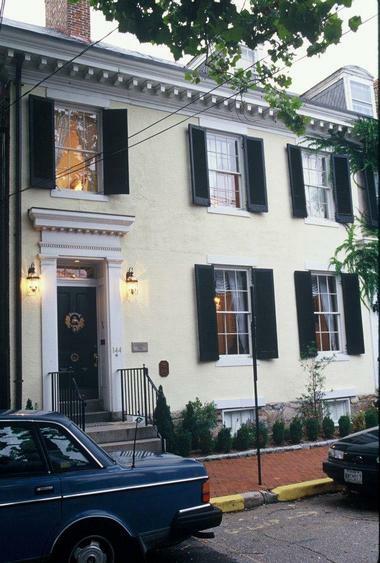 Situated on the prestigious Prince George Street in the heart of the Historic District of Annapolis, Maryland, The Annapolis Inn is a historic landmark townhouse that offers beautiful Victorian-style accommodations and a comfortable home-away-home ambiance. The well-appointed Georgian-era townhouse hotel features three luxurious guest suites with deluxe amenities and offers a sumptuous complimentary breakfast every morning. Surrounded by stately historic mansions and an array of exciting attractions, such as the State Capital, the City Dock, The US Naval Academy, and the famed St. John’s College, the hotel is ideally placed for exploring this charming city. Dating back 200 years to the days of the American Revolutionary War, The Annapolis Inn celebrates a place in American history and features intricate mid-19th-century finishes in the older section of the building, which provides one of the best examples of trim detail and finishes of the Greek Revival period in the city. 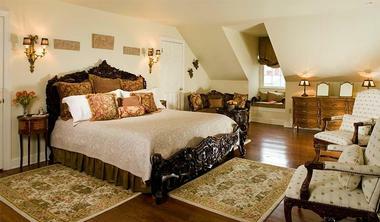 The boutique hotel is within walking distance of a range of Chesapeake Bay attractions. Wander the cobblestone streets to explore the fantastic dining and shopping destinations, stroll along the historic waterfront to catch a beautiful sunset over the Bay or hop on a brunch cruise around the lake. More ideas: Best Romantic Restaurants in Annapolis, Maryland. 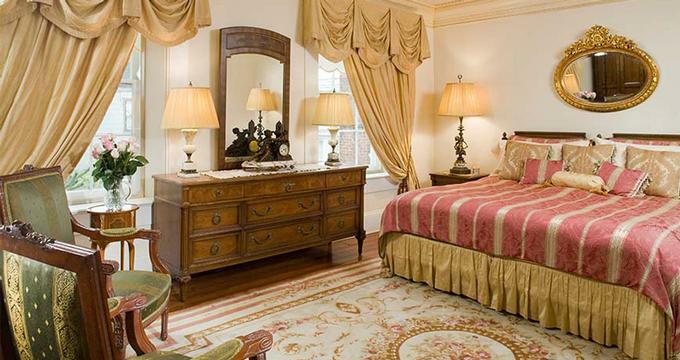 The Annapolis Inn features beautifully-appointed guest suites with lavish Victorian décor, antique furnishings and modern amenities, including individual climate control, heated towels rails and plush bathrobes. The suites do not have televisions, but they can be placed in the suites on request. The Iglehart Suite enjoys lovely views of the garden and Koi pond and features a king-size bed with luxurious, handcrafted linens, and plush pillows. Elegant Georgian period archways, intricate English tapestries, upholstered, antique chairs and marble reading table create an elegant and comfortable ambiance while soft shades of creams and blues add a royal touch. 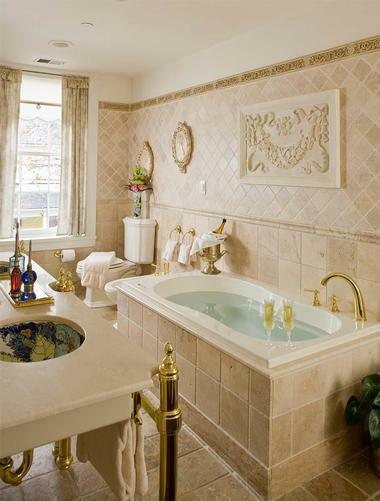 An en-suite bathroom has a distressed wood vanity with a marble countertop and a luxurious marble and tiled bathtub. 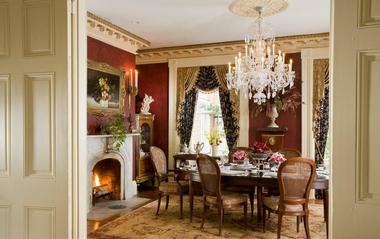 The Dr. James Murray Suite is formal and elegant with an 18th-century bedchamber and a separate sitting room with antique Victorian furnishings. The grand, oversized bedroom features a king-size bed with imported Italian linens and stunning brocades, a magnificent Oriental rug, and silk upholstered armchairs set in front of an ornate wood-burning fireplace. An en-suite polished marble bathroom enjoys underfloor heating, a glass-enclosed shower, marble bathtub and oversized double vanity. 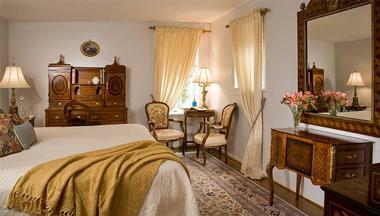 Heated towel rails, a bidet and commode and antique makeup table add extra conveniences. Large Greek Revival windows look out over the beautifully manicured gardens and Koi pond. A separate sitting room is home to extraordinary antique masterpieces, including an exquisitely gilded French secretaire and antique settee, and a marble wood-burning fireplace. 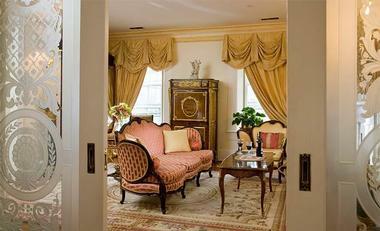 Decorative artworks adorn the walls, and oriental rugs cover the floors. Romantic and charming, The Rutland Suite is ideal for honeymooners or couples wanting an exclusive and secluded retreat. This rustic garret room features dormer windows draped with silk shades and cozy window seats with plush cushions and pillows. An intricately carved king-size bed takes center stage in the elegantly furnished bedchamber and is dressed in luxurious damask and brocade linens, and an en-suite bathroom has a claw foot whirlpool tub for two, glass-enclosed shower, bidet and commode, underfloor heating and heated towel rails. A beautiful sitting area has comfy oversized armchairs and a wood-burning fireplace, and a private sundeck is a perfect place to enjoy a leisurely breakfast or relax with a book and soak up the views. Find out more: 25 Best Things to Do in Annapolis, Maryland. Guests staying at The Annapolis Inn can begin the day with a delicious three-course breakfast served in the charming dining room and includes fresh fruit and parfait, homemade scones, jams and cream, cereals, granola and freshly baked pastries, egg, bacon and sausage dishes, and coffee, tea, and fruit juices. While the hotel does not serve lunch or dinner, there are a variety of dining options within walking distance of the hotel in the Historic District of Annapolis. Ranging from casual fare to fine dining, restaurants, cafés, and bars abound. The Annapolis Inn offers a variety of amenities, including in-room spa services, air-conditioning and individual climate control, laundry services, complimentary high-speed wireless Internet throughout the hotel, and a delicious complimentary breakfast. Concierge services include organizing and booking city tours, lake cruises, and dinner reservations at a range of restaurants around the city, as well as arranging shuttle transportation to and from the airport. The Annapolis Inn is an ideal venue for both corporate functions and special events such as weddings, receptions, and anniversaries. The beautiful garden and Koi fish pond make for a stunning outdoor setting for wedding ceremonies, and receptions and range of small rooms and venues can cater for various group sizes. The hotel offers state-of-the-art A/V equipment and technology, on-site catering and customized menus, as well as numerous restaurants and entertainment options in the area, and events planning team that will take care of every detail whether it is a business or corporate event or a wedding, reception or other special function. The Annapolis Inn offers a variety of packages for special occasions, ranging from weddings and anniversaries to business retreats. Charming Romance Packages include a round-trip town car service to and from The Annapolis Inn to destinations of your choice, and a chartered sailboat or powerboat for the morning, afternoon or entire day, with the choice of having a captain and crew or sailing solo. On arrival, a beautiful bouquet of red roses or flowers of your choice will be placed in the room, and a one hour in-room massage for two can be enjoyed at any time during your stay. Other special extras in the Romance Package include champagne, wine or a beverage of choice offered on arrival or presented in the comfort of your suite, along with chocolate covered strawberries, and special made-to-order birthday/anniversary/wedding cakes for every occasion. Guests will receive two complimentary keepsake Annapolis Inn champagne flutes to remember the special occasion by and a personal turndown service with fragrant rose petal sprinkles is offered every night during the stay. Customized Wedding Packages include the use of the hotel’s elegant parlor or beautifully manicured garden and Koi pond for wedding ceremonies and receptions, a marriage ceremony Officiant to oversee proceedings, and a special made-to-order wedding cake for two. Wedding cakes for larger groups or parties can be ordered on request when booking the package. Two-hour cooking classes can be enjoyed with friends and teach healthy and nutritious cooking techniques and share recipes. Annapolis offers a variety of attractions and activities to enjoy throughout the year, ranging from walking tours of the city and its magnificent historic homes and museums in the spring and summer to attending lectures, exploring art galleries or taking in musical and theatrical performances in the autumn and winter. The Annapolis Yacht Club hosts sailboat races every Wednesday evening and offers sailing and power boat classes while the Naval Academy puts on sporting events throughout the year. Don’t miss the famous annual croquet match between St. John’s College and the Naval Academy, which is a tradition as old as the city itself. During the cooler autumn and winter months, there are Navy football games, candlelight and haunted house tours, Halloween concerts and other musical and theatrical performances to enjoy in and around the city. Annapolis and Anne Arundel County both have a long and illustrious American and maritime history, which is reflected in the many attractions and interesting sites to explore in the city and the surrounding area. Also known as the ‘Sailing Capital of the World’, Annapolis has a deep connection with the water, as well as a rich African-American history and culture, both of can be discovered in the many museums, galleries, cultural centers and other attractions around town. - The Ann Arundel Historical Society, which offers a year-round schedule of programs and activities relating to the county’s history and culture. - The Annapolis Maritime Museum, which offers an in-depth look at the city’s 400 years of maritime history. - The Baltimore & Ohio Railroad Museum is home to 40 acres of railroad history from the Birthplace of American Railroading. - The Benson-Hammond House – Built in circa 1830, this house is one of the last surviving farmhouses of the once-booming local farm industry and stands as a period museum. - The Waterfront Warehouse is home to some rare surviving examples of the small warehouses that dotted the Annapolis waterfront in the 18th and early 19th centuries. - The Wiley H. Bates Legacy Center and Memorial Courtyard is a unique cultural arts heritage museum displaying historical documents and collections that preserve the Bates Spirit. - St. John’s College was founded in 1696 as King William’s School and was the site of Revolutionary and Civil War encampments. The surrounding Anne Arundel County offers a variety of recreational and leisure activities, including hiking, mountain biking, and picnicking, as well as water-based sports such as sailing and fishing.